If you've been wondering where the bearded, slim-hipped throngs of Daft Punk-worshipping, artisanal razor-shaving blog cliches prefer to get their kale and PBR, well, Yelp has got you covered; the all-encompassing Reviews of the People site has been kind enough to create heat maps documenting where reviewers mention words like "yuppie," "tourist" and "bacon" most, and naturally they've documented where the "hipsters" come to gather. And, surprise! 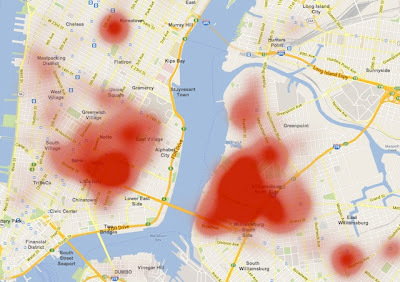 The darkest redhot smudge lies right over Williamsburg. Sadly, the words "fibster," "yupster" and "scarf-wearing $800K condo-dweller" were not awarded the Yelp heat treatment, but just assume the locations are one and the same. Heat maps for other words such as frat, cheap, and cocktail are here. My own Upper East Side hood is quite low for "bacon" and high for "kosher," which makes sense. But it's also dark red for "romantic," which does not.